Massachusetts Plumber: Dave McDonald, the owner of American Plumbing & Heating. Worcester County, Blackstone Valley and Metrowest Massachusetts areas. We have over 30 years experience and can solve any plumbing problem you have. Bathrooms, kitchen, laundry room, heating systems and more. Serving these towns: Manchaug, Douglas, Sutton, Oxford, Northbridge, Webster, Auburn, Charlton, Millbury, Mendon, Milford, and other areas. 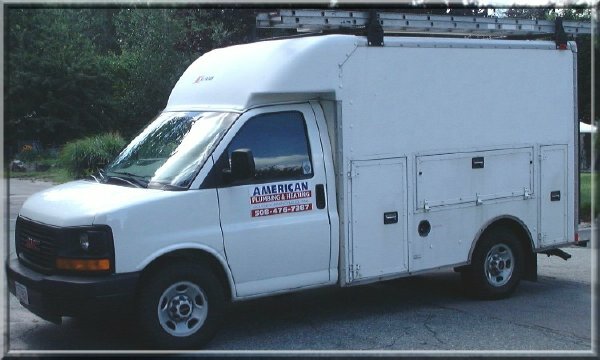 Dave McDonald, American Plumbing & Heating has been serving the Worcester County, Blackstone Valley and Metrowest Massachusetts areas for over 30 years. 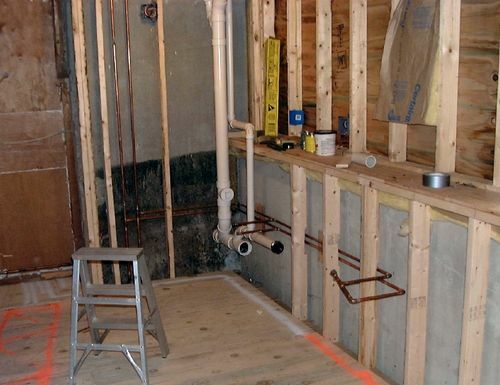 We're fully licensed & insured and comply with all plumbing regulations. Experienced We have over 30 years experience. Your problems are important to us. When you call, we come right away. 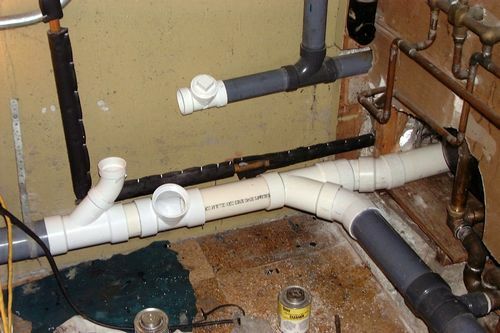 We're very skilled at solving even the most complex plumbing problems. We carry a minimum of $1 Million liability insurance for all jobs. We arrive when we say we will, we do good work and we clean up when we're done. We can work closely with your contractor, to make sure your fixtures are installed correctly - even during a remodel or new construction. 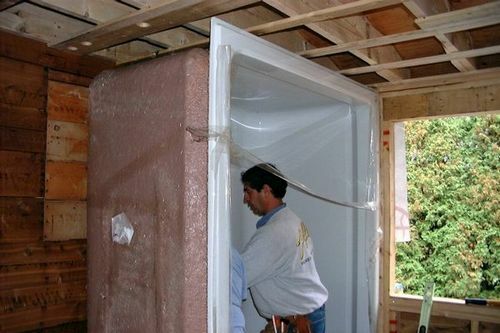 Here you see us installing a 1-piece shower during a recent home addition. 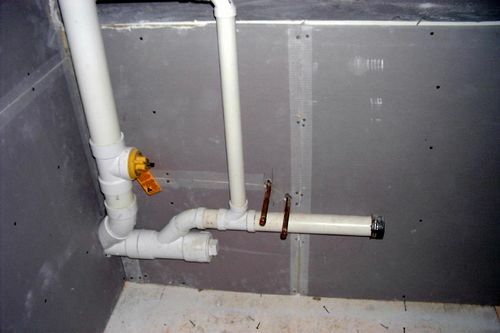 This photo shows the underneath plumbing of the shower, sink & bath for the photo to the left. We can handle limited-space installs. 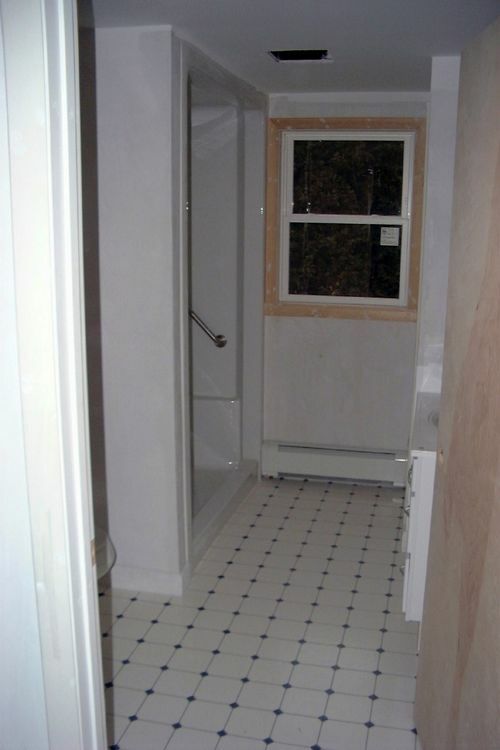 Here we see the bathroom shower after most of the work is done. We did the shower, sink, toilet, vanity, all piping and the high-capacity baseboard heating (oil fired hot-water) in this room. 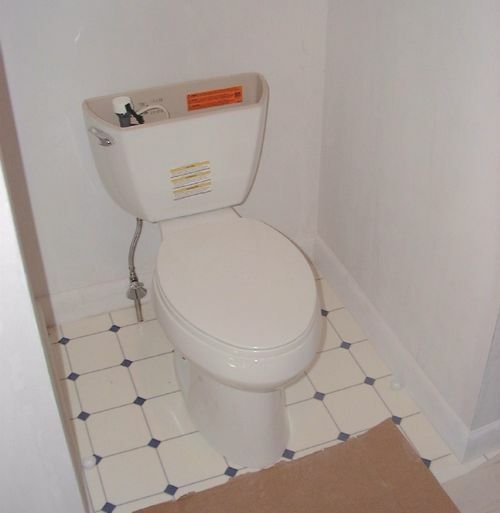 This is a handicap accessible, ADA compliant, comfort seat toilet with improved flow water-saving flush cycle. Saves water and is easier to use. Saves water, more comfortable and easier to use . 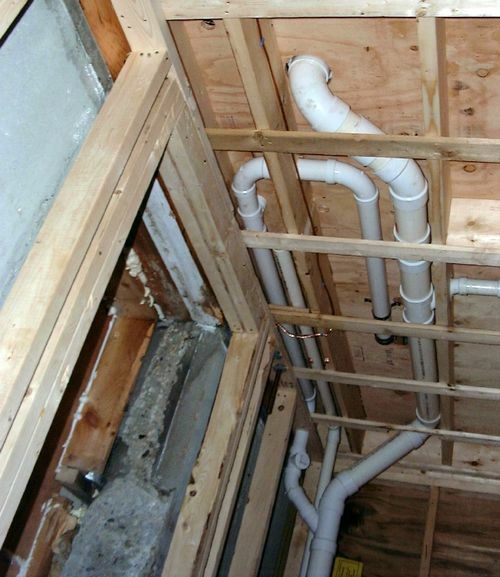 Our methods of careful planning allow us to deliver plumbing solutions on-time and affordably. Here you see as we begin to install a laundry room . Here you see some of the laundry room plumbing as it approaches completion - after the contractor has installed the drywall. 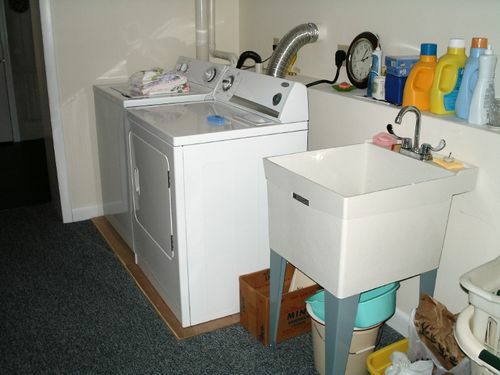 Here's the completed laundry room, fully installed with a utility sink - conveniently oriented for easy access. Here's a nice solution we added to a pre-existing situation: We added a water cut-off valve and stainless braided hoses to control water and prevent leaks from a busted hose. Because we do plumbing and heating, we can handle everything from soup to nuts. 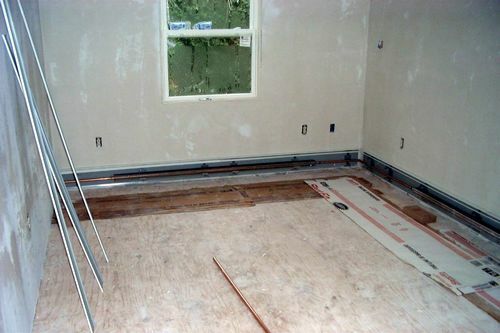 Here you see a new installation of a baseboard hot-water heating system. This photo shows a solution we engineered for a homeowner's new addition. 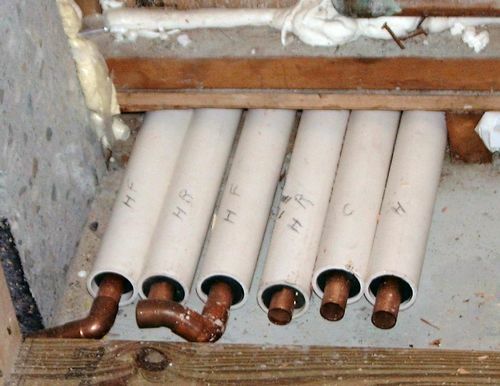 As you can see, we insulated the heat pipes, return pipes, hot water and cold water pipes with an adapted system for maximum thermal retention. 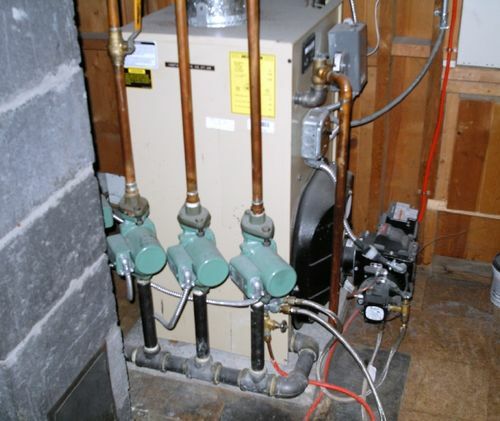 If you need to install a new boiler, we can do it for you, or we can work closely with your oil delivery company to assure everything gets done to your satisfaction. Here's a boiler which we helped install in a limited space area. 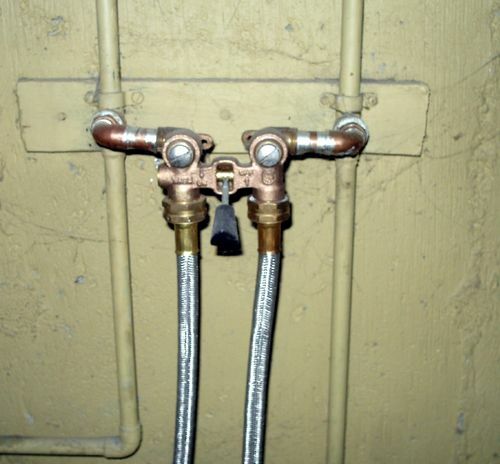 Here we see a complicated plumbing area in a basement behind a laundry station. We got right in there, rolled up our sleeves and fixed everything the same day. We can solve any plumbing problem you have. American Plumbing & Heating, Massachusetts Plumber. Sutton (Manchaug) & local areas.